coverage from Day 2 is linked below! 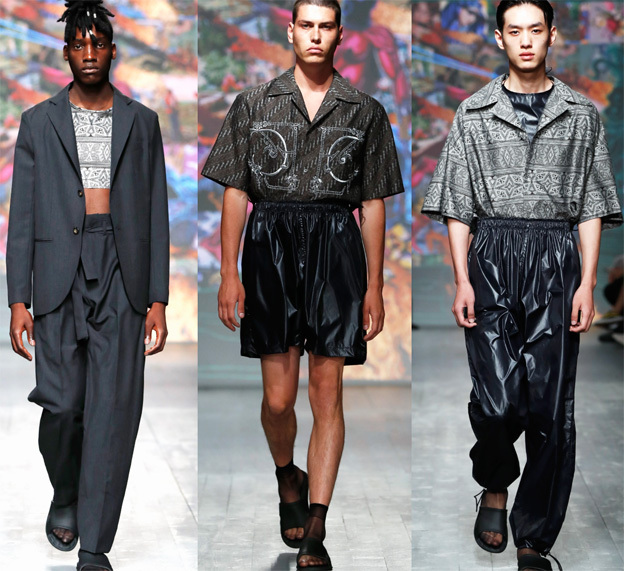 Daniel w. Fletcher’s SS19 collection was initially inspired by sunrise and the dawning of a new hope. Taking inspiration from men’s business attire, pinstripes and a neutral colour palette were heavily utilised, with most of the collection appearing in shades of navy, brown and grey. Silhouettes were anything but classic, however, as workwear was refreshed with a new vigour. Suit trousers were slashed at the hem, forming a quasi-flare, and corsets appeared in place of waistcoats with rope binding them together. An additional feminine silhouette was the fitted jersey halter-top. Flowing silk shirts and scarves were printed with paintings by the artist Caitlin Keogh and featured Grecian female busts constrained by chains and rope. An indictment of the restricted and misogynistic narrative allotted to businesswomen perhaps? 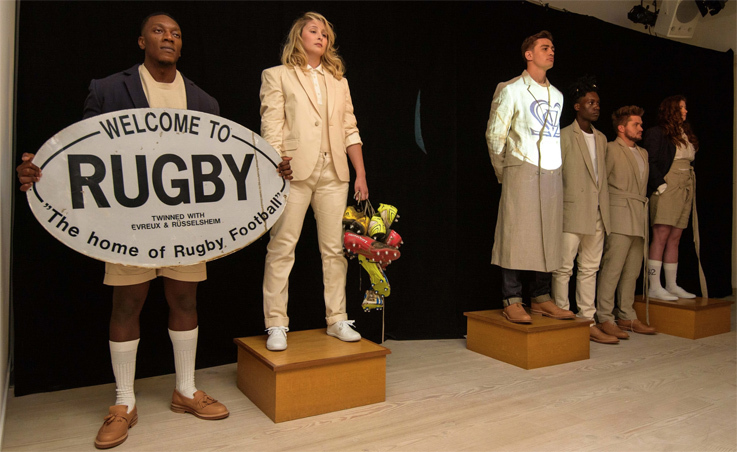 CV22 – Rugby – England’s SS19 presentation was the charming story of Rugby told through an immersive multimedia installation. The birthplace of its namesake sport, this small English town has long since been associated with classic athletic wear for the busy sportsman as well as traditional menswear for the sophisticated British gentleman. 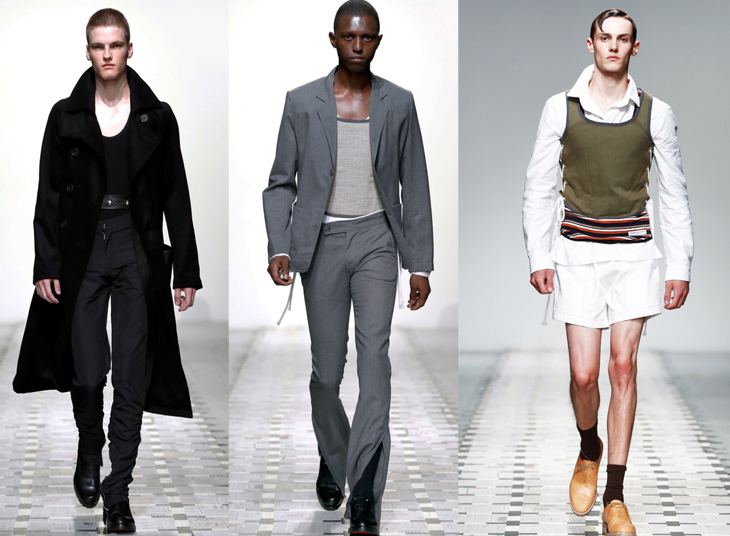 This season, clothing was cleverly reduced down to its essence. At the core of the collection (some of which is produced at our very own Fashion Studio) were blazers, trousers, button-ups and polo shirts crafted out of raw, undyed cotton, creating a pared-down yet contemporary sentiment. The presentation was not wholly minimalistic, however, as projections of varying prints and colours were superimposed onto selected pieces, treating them almost as a blank canvas and allowing the collection to expand beyond the finite amount of looks that were shown. 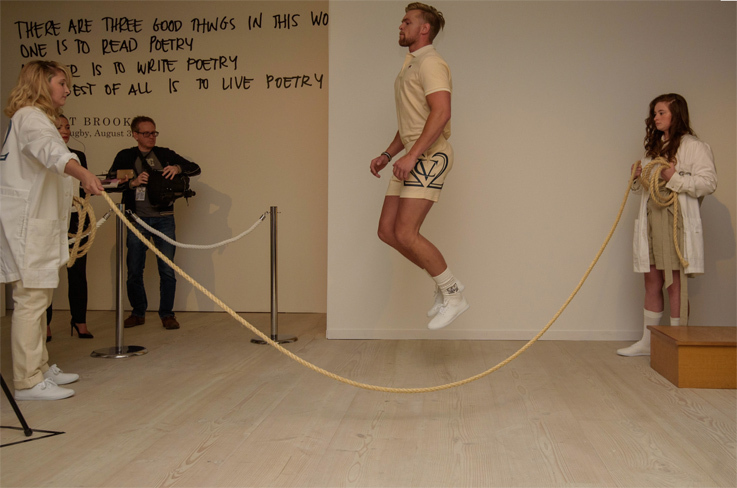 Shining the light on old-school sport, models took it in turns to jump into a skipping rope for short bursts of time, adding a quirky school-playground-esque quality to the entire experience. Although the clothing itself was fairly simple, it managed to evoke a feeling, a sense of nostalgia as well as fresh modernity. 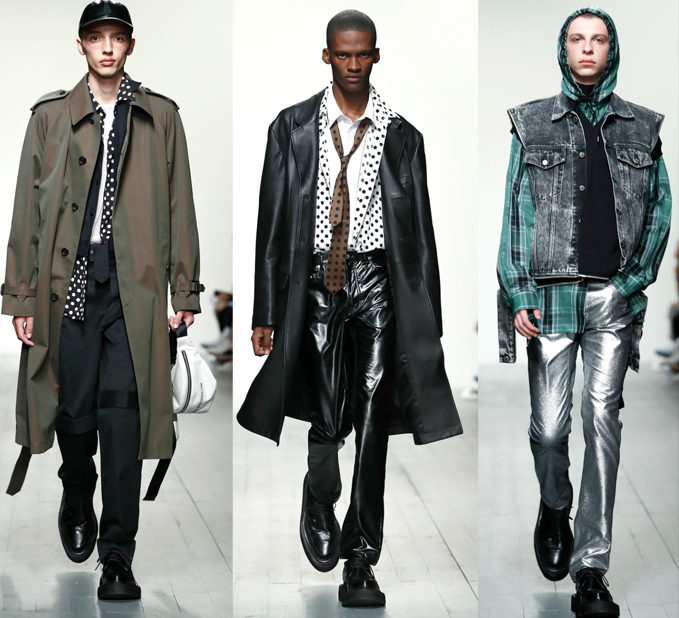 John Lawrence Sullivan’s SS19 collection had its roots firmly in the post-punk and new wave movements as models walked the runway sporting high-shine PVC, washed denim, long trench-coats, and platform boots. Graphics and prints were lifted from the pages of Lurker Grand’s book Hot Love: Swiss Punk & Wave, 1976-1980, with notable examples being the word “afterdark” quoted in embroidery detailing and the recurring polka dot print derived from an underground band’s promotional image. More specific references to Dave Gahan of Depeche Mode manifested themselves in black leather trousers and crop tops – my personal favourite being the cropped hooded sports jacket in a sunny yellow. The bright green colour-blocked suit was also an absolute show-stealer. Gahan’s love of sharp-shouldered angular tailoring was also explored but was updated and made more sophisticated with the incorporation of heritage tartans. As is founder Arashi Yanagawa’s modus operandi, this collection involved reimagining tradition, resulting in a modern vision of an iconic subculture. 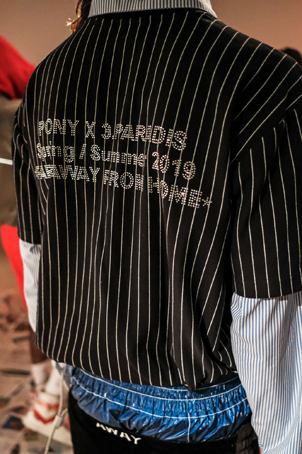 3.PARADIS & PONY’s capsule collection for SS19 was entitled “FAR AWAY FROM HOME”, a name which was both a literal reference to the brand being far away from their origins in New York and a metaphor for all those who have uprooted their lives hoping for a chance at finding paradise. 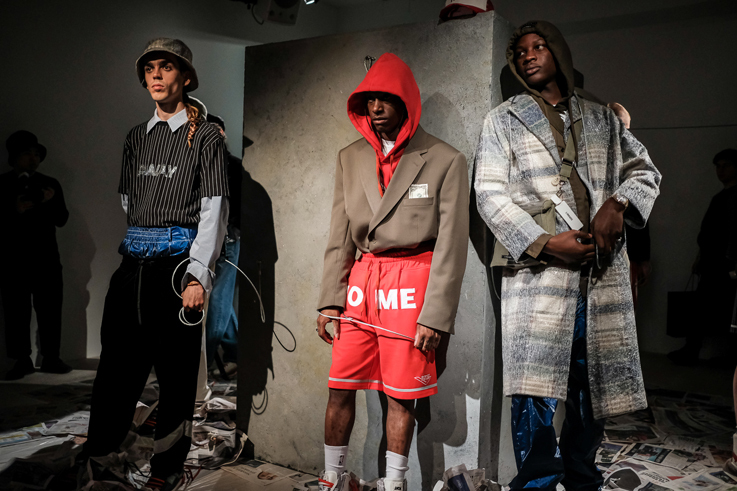 This season we saw an amalgam of athletic streetwear and minimal tailoring; interesting layering and unexpected materials also helped draw the eye across all the looks. Some pieces were distinctly more utilitarian than others with pockets, buckles, and zips featured as design details. Although these aesthetics seem to contrast greatly, they were, in fact, able to help convey the many meanings of “HOME” and “AWAY”. At face value, we could interpret these notions in line with PONY’s sports background and consider the sportier elements as an athlete’s home and away uniform. On the other hand, we could look at the utilitarian aspects of the clothing, as well as the tailored pieces, and consider them the markers of someone who has left their home and is now trying to attain a better quality of life. The practical pieces could suggest the abandonment of frivolity and leisure while the tailoring could suggest a new working environment and the pursuit of a worthy career. 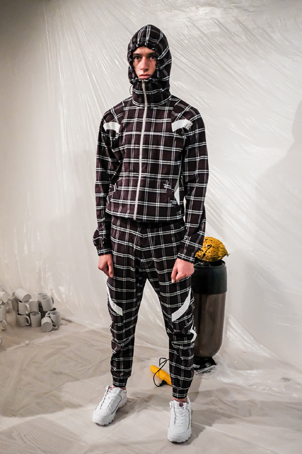 All in all, this collection effectively explored the different stories concerning being “FAR AWAY FROM HOME”, whether they be mundane, life-changing, or something in-between, and created a sense of sentimentality amongst a sea of utilitarian athleisurewear. For SS19, Edward Crutchley crafted a collection focused on movement and drape, with silhouettes having a sense of ease and lightness even when layered. Japanese inspiration was at the forefront of this collection with sleeveless samurai vests, lightweight sack-back dresses, and classic robes walking down the runway; in addition, many of Edward’s partnerships this season were with Japanese designers. Chiso, a renowned Kyo-yuzen kimono manufacturer founded in 1555, collaborated in the creation of a fabric which mixes hand-painting, foil print, and ink jet print, and thus brings a centuries-old tradition into the 21st century. Shimogawa, a textile company which produces “Karume Kasuri” (traditional ikat weaving), was utilised in melding the East with the West as we saw their fabric used in touristic Hawaiian shirts and shorts. In terms of melding the old with the new, Toyota Gelanots helped engineer a micro fibre nylon coated in Japanese black lacquer and Shieso Company created seamless technical knitwear (and I mean seamless literally here, all their garments are created as fully formed pieces, how cool is that?). 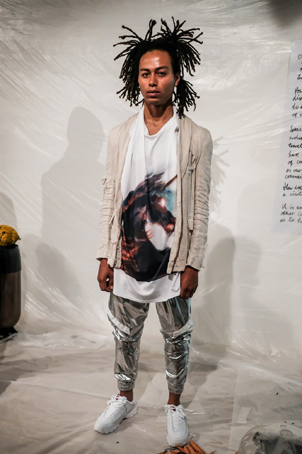 Aside from Japanese inspiration, we also saw Edward’s affinity for mythology in his collaboration with artist Lucien Murat as they explored the strange and grotesque world of Manichaeism through a series of prints and embroidery. Bower Roebuck, one of England’s oldest mills, provided the Yorkshire suiting woven in a blend of merino wool and mohair. 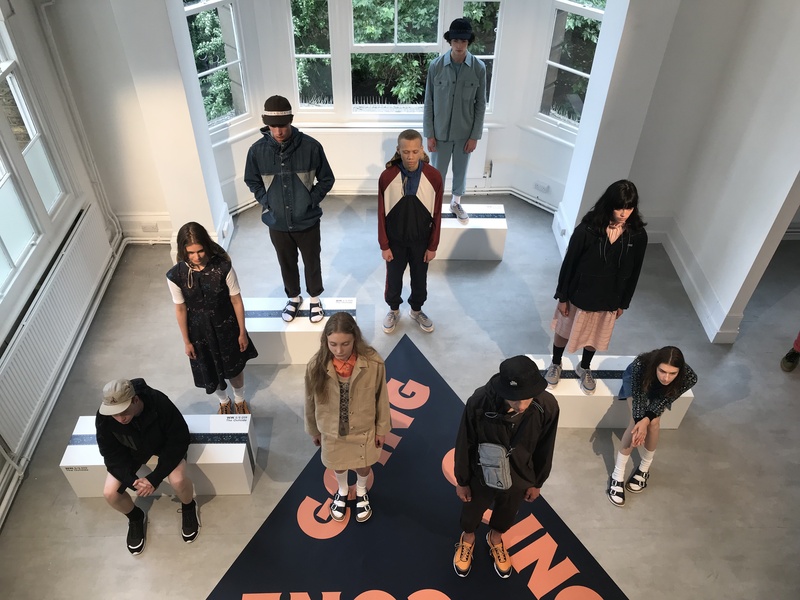 This season, Edward Crutchley succeeded in delivering a collection which encompassed the East and the West, the traditional and the innovative, the grotesque and the beautiful, and showed us that inspiration needn’t be streamline or distilled in order to be powerful. 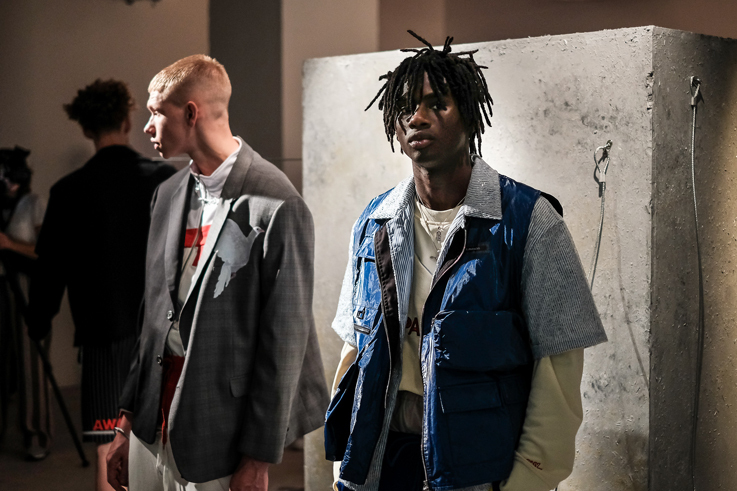 For SS19, Matthew Miller and footwear brand K-Swiss unveiled a collaborative project entitled REDUX, a sleek streetwear collection produced wholly from recycled materials. Taking old brand merchandise that would have otherwise gone to landfill, they instead created modern designs which included slouchy loungewear as well as more tailored pieces. 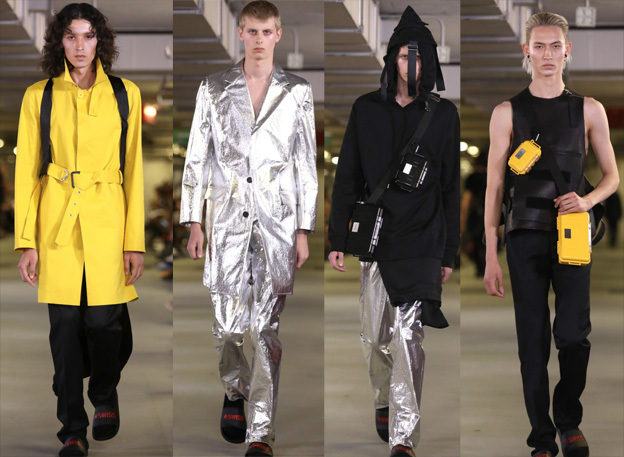 Standout moments were the fashion equivalents of ballistic vests as well as the ending looks of the collection which looked like they were made from emergency thermal blankets (you know, the shiny space blankets?). Imagine how much fun you’d have rustling about in those! 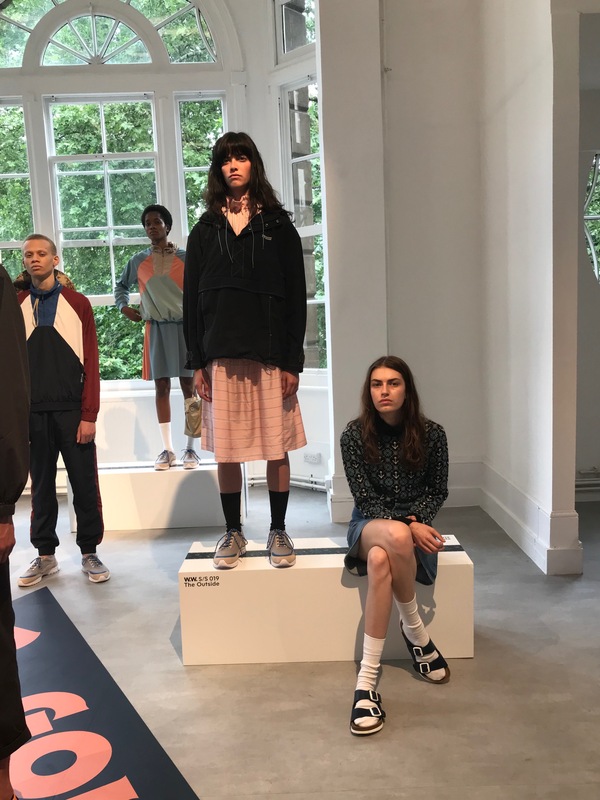 Accessorised with K-Swiss footwear styles such as the Classic VN, sliders, and the new ST529, as well as bags that looked like security boxes, the models gave off a utilitarian vibe that verged on armoured truck driver? As well as recycled fabrics, these looks incorporated sustainable materials, showing us that clothing truly can be innovative as well as responsible, fashionable as well as environmentally-friendly. 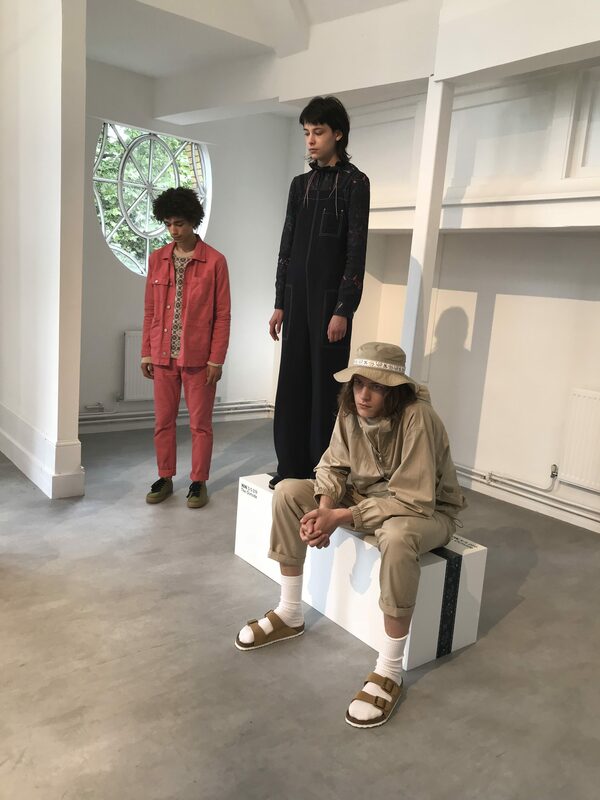 For SS19, Wood Wood took us on a ramble through nature with a collection entitled “The Outside”. Being in a generation hyper-focused on technology and the Internet, Wood Wood wanted us to take a step away from all of that and instead embrace everything the Earth has to offer. Pieces this season equip the outdoorsman and the explorer, with clothing built upon 90’s activewear designed to feel light, functional, and sporty. We see casual cropped trousers, hooded anoraks, oversized shell jackets, simple cargo pants, and my personal favourite, bucket hats. For womenswear, there is a sense of natural femininity with draped dresses and skirts in colourful prints as well as delicate knit tops. Sportier styles include colour blocked jerseys, a classic Wood Wood tracksuit and loose-fitting tailored pieces. An oversized jumpsuit with contrast stitching in a navy twill rounds off the women’s range. Throughout the collection we also see inspiration from Nordic folklore with embroidered artwork on woven tape as well as a substantial amount of knits. JORDANLUCA’s presentation was an odd experience to say the least as it was an exploration of The Flat Earth Society. Even before they entered, guests were handed press releases by men in boiler suits who wore sculpted coat hangers as headpieces? Plastic wrap covered the presentation space and dotted around were a stack of mugs, a vintage computer, a microphone, TV aerials, stepladders, a fan, and an assortment of vegetables (mainly corn). Much of the clothing consisted of jackets with drawstring hoods which tightly hugged the models’ faces. 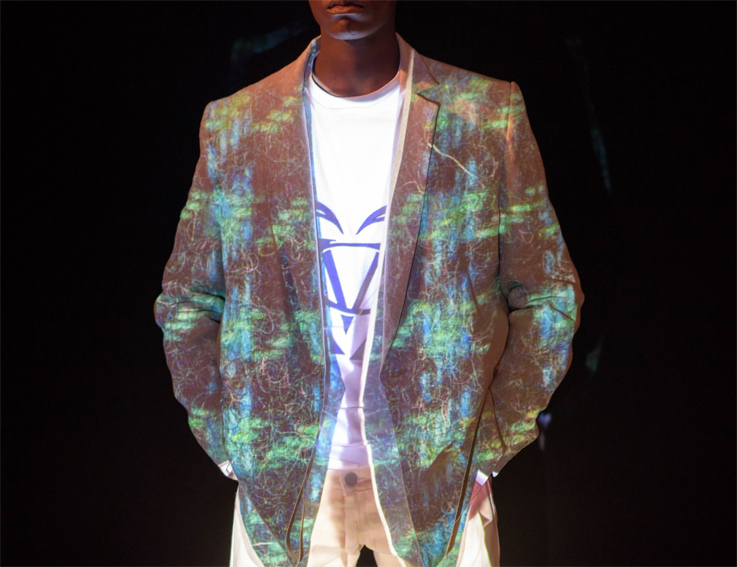 Clear and reflective textiles were used in a nod to the future, space, and alien life, but seasonal linens, seersucker, and denim were also incorporated. 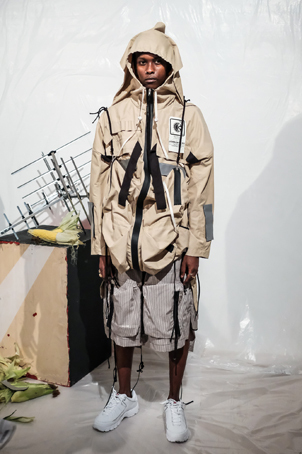 This SS19 offering was essentially a conspiracy theory come to life, highlighting cult phenomena and the importance of the quest for truth (even if it is sometimes misguided).